This sanctuary is located East Godavari district. Its area is 236 sq km. The sanctuary is part of the estuary of river Godavari and supports a rich growth of mangrove vegetation with plants like Rhizophora, Avicennia, Sonneratia, Aegiceros etc. Animals found are Fishing cat, Otter, Jackal, Sea turtle and estuarine crocodile, which are found in the creeks. Among the birds most common are Seagulls, Storks, Herons, Snipes, Ducks and Flamingos. Accommodation is available in the forest rest house at Coringa and Rajahmundry. Best season to visit October to May. Rail: 20 km from Kakinada railway station and 70 km from Rajahmundry. 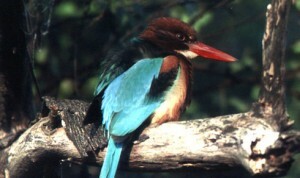 This entry was posted in Andhra Pradesh, Coringa Wildlife Sanctuary. Bookmark the permalink.